This classic comb will work as bridesmaid's jewelry or for prom wear as easily as it will go to a casual luau. The pale blue glass pearl and teal Swarovski crystal floral design is pure femininity. 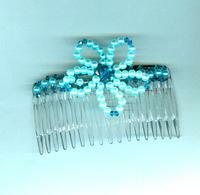 The flower measures about 1-3/4" across, and stands proud of the 3" wide acrylic hair comb. I can turn out multiples with ease, and can do other colours, too (please see other hair combs listed on this page). Why not hold back your bonny hair in style and be noticed at the same time? When colourful beauty is what you want, look no farther than SPARKLE PLENTY. This honeysuckle pink and teal beaded cocktail ring is as hot as a night in the tropics.